Gamble Rogers was a folk musician, storyteller, and by all accounts one of the coolest and nicest people in Florida. He was born into a legacy of important Florida architects but chose a path he termed the “Troubadour Emeritus.” Throughout his three-decade career, Gamble was one of the premier figures in southern folk music. Most of his oeuvre was dedicated to the fictional locale of Oklawaha County Florida, which he peopled with hilarious and deranged characters and imbued with a history that defined central Florida in its transitions from the rural south through corporate orange groves, nation-sized theme parks, and federal rocket launches. For comparison’s sake, he embodied a kind of writer and chronicler similar to Garrison Keillor. Gamble Rogers died at the age of 54, at Flagler Beach FL, while attempting to rescue a drowning man. That beach is now a State Park named after him; there are folk festivals named after Gamble; middle schools named after Gamble; he’s in the Florida Artists Hall of Fame; but outside of Florida he is remembered for his appearance in the great documentary Heartworn Highways, his numerous turns on NPR’s All Things Considered, and in the music of the many people his tutored in guitar picking and songwriting. 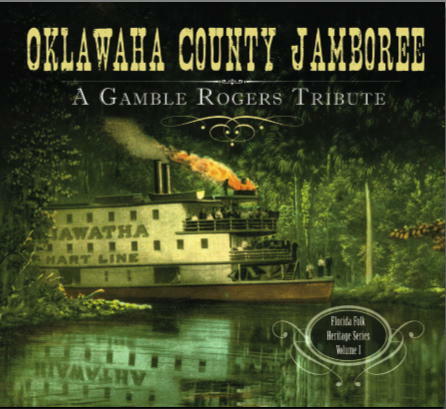 A new tribute album, Oklawaha County Jamboree, was just released by Lis and Lon Williamson’s Gatorbone Records in order to raise money for the yearly Gamble Rogers Folk Festival. Everything about this tribute is gorgeous and loving–from the packaging which features a booklet of small essays and archival photos, to the CD itself which looks like black vinyl, to the all-important songs, recorded beautifully by the Williamsons and the cadre of younger artists gathered to forward and extend Gamble’s presence. and philosophy in idle talk. still, I learned to smile. Before the years of wine and steel. The big surprises for me here were the commanding performances from The Willowwacks on “The Girl from Stony Lonesome,” Todd and Molly Jones on “Careless Love,” and Chris Henry on “Blood Mountain.” As intended, this CD serves its featured artists as much as its honoree. It’s a great introduction to these musicians. There are a couple of interesting components of this record–1) the artists here have chosen to let alone Gamble’s spoken word stories and 2) only five of the fifteen songs here are Gamble’s original compositions, most being traditionals or covers that were part of his repertoire. That said, these choices do not get in the way of the album’s goal, which is for modern artists to interpret Gamble’s art in a way that connects his generation of musicians to their own. You can feel Gamble’s presence strongly, and with the addition of songwriters like Billy Joe Shaver, John Stewart, and Merle Travis, you get a better idea of where he was coming from and in what tradition he liked to place himself. You get a new, self-sufficient document here–one that can rest on the power of the current generation of musicians. However, these choices also mean that a lot of the Oklawaha County world is left off the record, Gamble’s stunning phrasing and humor aren’t carried forward so much here–still, they are always on Gamble’s own works, which can be ordered as CDs, LPs, and songbooks from his memorial foundation. At the foundation website, you can also find a jukebox that plays all of Gamble’s records, and a bunch of live performances. 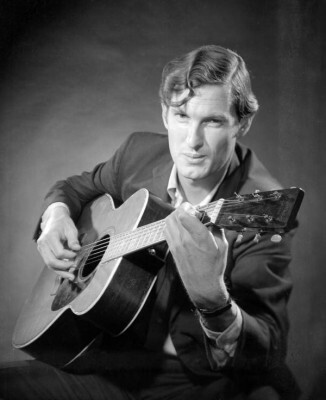 His catalogue is not available digitally, which needs amending, but you can download a free audio archive of Gamble’s May 27, 1978 performance at the Florida Folk Festival from the Florida Folklife Collection as a podcast HERE. Do not miss out on that. This tribute is billed as “Florida Folk Heritage Series Volume 1” and I couldn’t be more excited for the possibility of this series continuing. Order the CD at the website for Gamble Rogers Folk Festival. OK, so tell me where he was in Heartworn Highways- I’m drawing a blank. He tells a story called “Penrod and Elfrieda,” which is called “Charlie’s Place” on the soundtrack–it’s about a bar and a girl who dances to Peggy Lee’s “Fever”– and then he segues into “Black Label Blues,” a song about Jack Daniels.